Hughes Europe, a wholly owned subsidiary of Hughes Network Systems, LLC (HUGHES) announced it will join GMC at the Antibes Yacht Show, Port Vauban, Antibes, France, from April 7 to 10, 2011s (Stand BSJ B453), enabling WiFi connectivity ‘powered by Hughes’ at this important event in the maritime calendar. The specialist provider of high-quality communications for merchant and private vessels will showcase its robust solutions using Hughes advanced broadband satellite technology and services. “In looking to strengthen our reseller base,” says GMC’s Andreas Evans, “this event provides the ideal opportunity to show potential distribution partners how our innovative and highly cost-effective communications solutions, together with Hughes Europe’s robust broadband satellite technology and Maritime Services, offers state-of-the- art flexible connectivity for the increasing requirements of a growing segment of the maritime market. Hughes Maritime Broadband Services, based on the proven HX platform, is the first to satisfy the maritime market’s demands for high-availability broadband connectivity with specified Quality of Service (QoS) and Committed Information Rates (CIR). 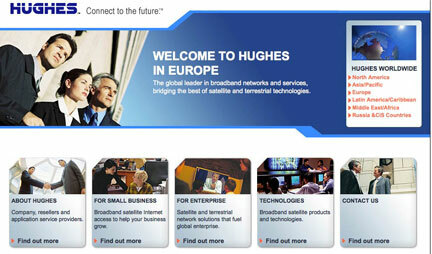 In particular, by offering flexible bundled high-speed Internet, voice and fax services, and fixed monthly billing―delivered over commercial-grade terminals incorporating compact and light 60cm Ku-band antennas―Hughes offers the highest reliability and best value maritime solutions available in the marketplace.